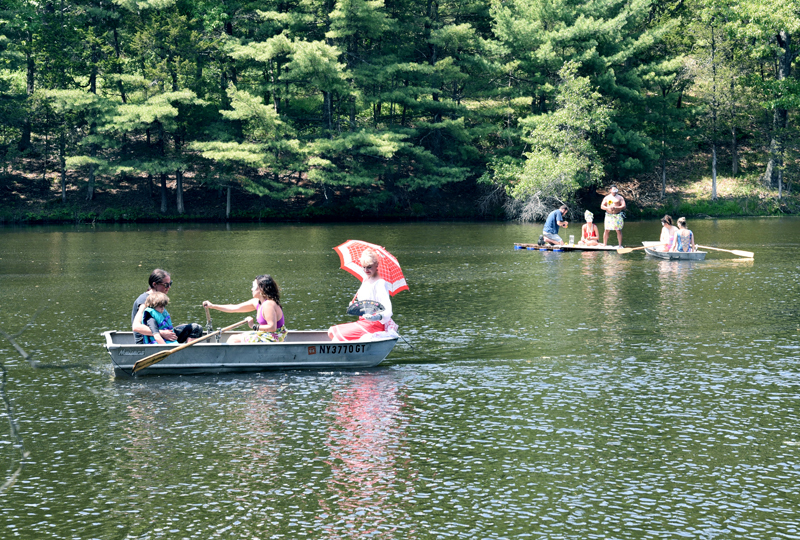 “Gypsies' Picnic: The veins of Oya was always here”. 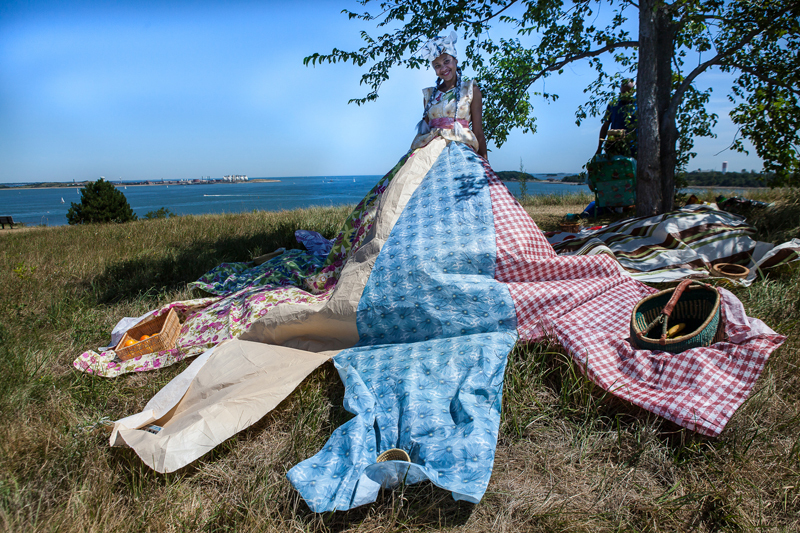 2014-15 mixed media, performance durational TBS04 at Spectacle Island, Boston, M.A. “Gypsies' Picnic: The veins of Oya was always here”. 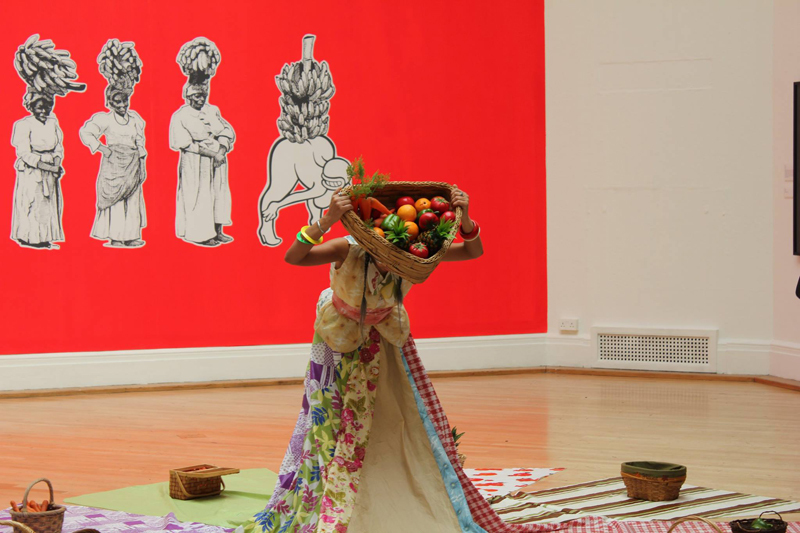 2014-15 mixed media, performance 2 hours Royal West of England Academy of Art, Bristol, U.K.
“Gypsies' Picnic: The veins of Oya was always here”, detail. 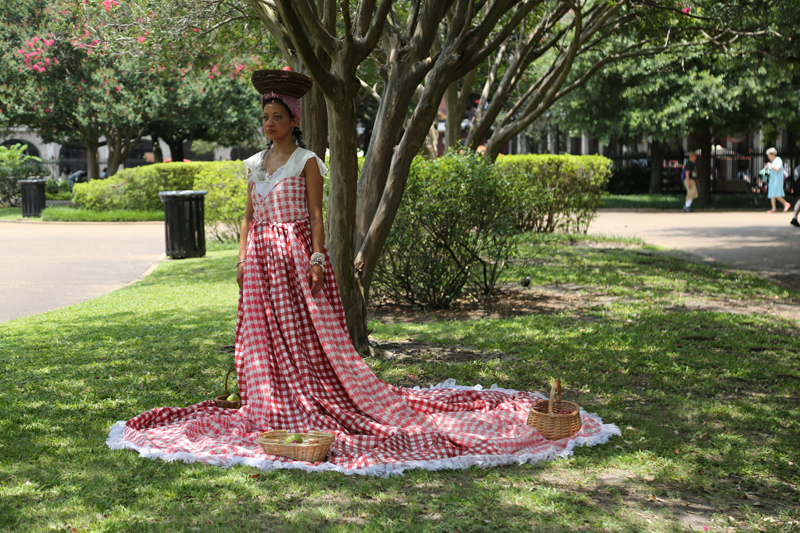 2014-15 mixed media, performance Royal West of England Academy of Art, Bristol, U.K.
“Gypsies' Picnic: The feast of those gone by”, 2015 mixed media, performance 20 minutes Jackson Square, New Orleans, L.A.
“Gypsies' Picnic: The feast of those gone by”. 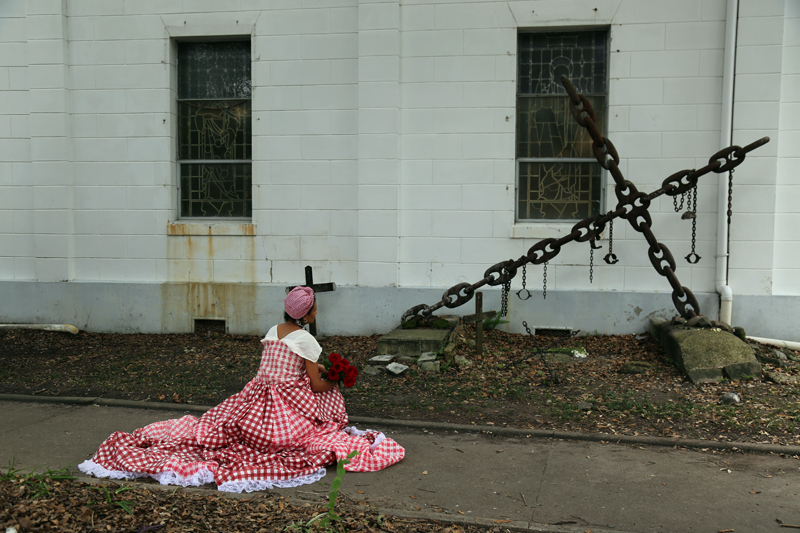 2015 mixed media, performance 20 minutes Tomb of the Unknown Slave, New Orleans,L.A. 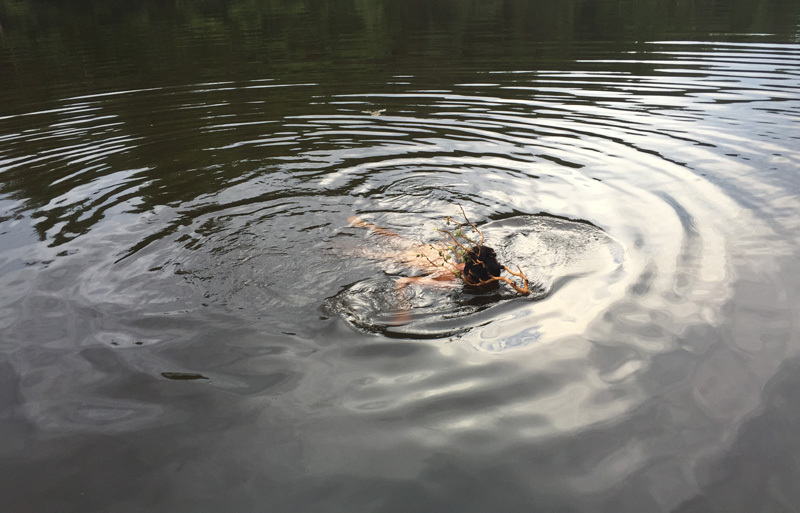 “Luncheon on the Lake”, 2016 Performance 1 hour Rosekill Artist Residency, Rosendale, N.Y.
“Am I pretty now?”, 2015 performance 10 minutes Rosekill Artist Residency, Rosendale , N.Y.
“Resident Alien”, 2015. performance with sound component, printed media 15 minutes Grace Exhibition Space, Brooklyn, N.Y.
“The Calling of the Light”,2014-15. 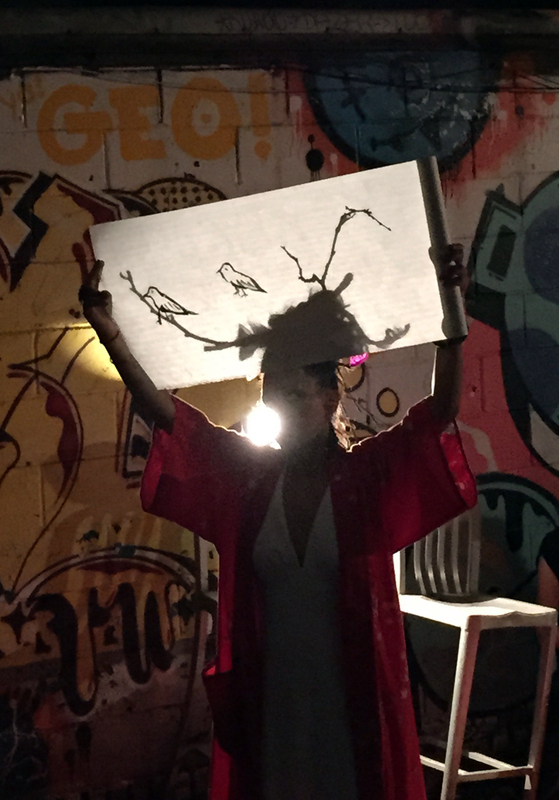 performance 20 minutes Gallery Sensei, New York, N.Y.
“Three Little Birds”,2015. performance 20 minutes ABC No Rio, New York, N.Y.
“Color Chameleon”, 2015 performance, sound component, 20 minutes SELECT Art Fair, New York, N.Y.
“The Lost Tribe of Mount Madagascar”,2014 performance 3 hours LUMEN Festival,Staten Island, NY. 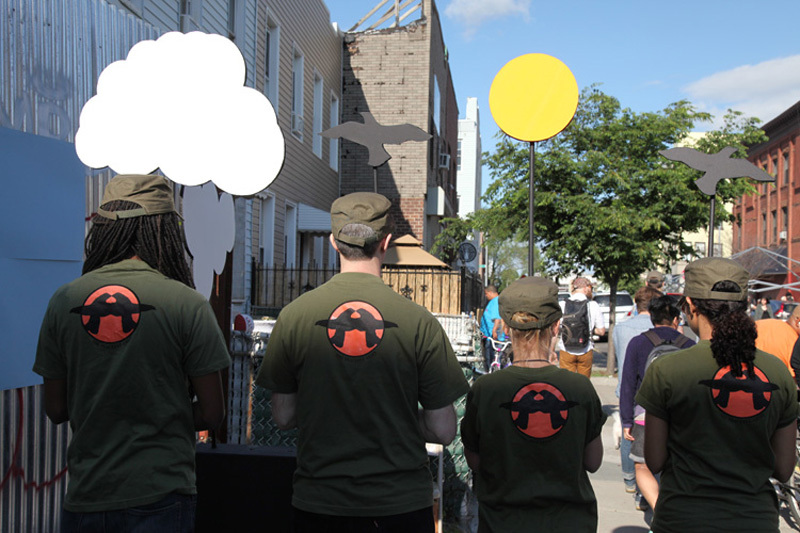 "The Peaceful Army”, 2013-14 Performance, w/ silk screened t-shirt, hats, wood, foamcoare, acrylic durational Bushwick Open Studios, Brooklyn, N.Y.
“Wo shi yi ge zi sun (I am just a descendant)”, 2013-14 performance 12 minutes Soho 20, New York, N.Y.
My work explores performance and installation art, drawing from the nostalgia of my homeland Jamaica, the commodified imagery of Caribbean primitivism, folklore, fantasy, consumerism, spirituality and nature’s ephemerality. My recollections come from a childhood reared in the Caribbean, at the edges of standardized Western culture, where daily struggle causes those standards to drift. In some ways my idyllic Jamaica no longer exists. An immigrant’s memory of their country is both frozen in time and lives a life of its own, where it perhaps comes to represent something else entirely. 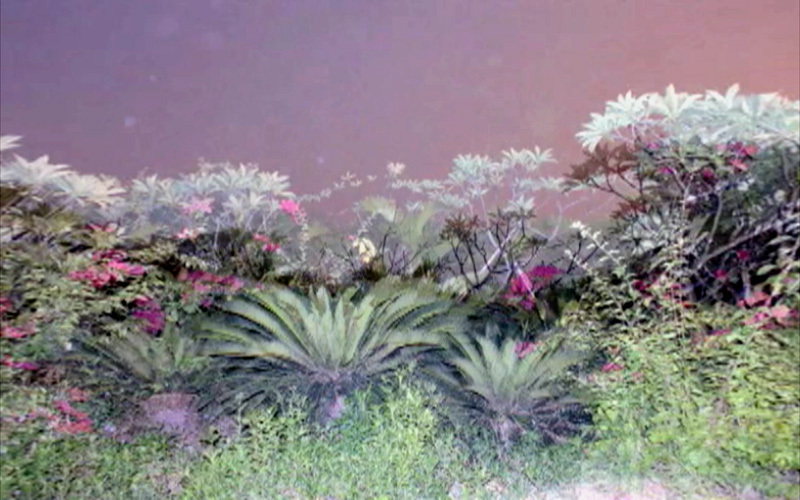 My art aims to pinpoint that fleeting image of a perfect landscape by its raw nature, and wondrous paradox. It is this desire for an ideal landscape that intrigues and invites me to interact with it. An obsession with capitalism and consumption also informs my process. Objects whether functional or not infiltrate a space and bring into question their purpose or function.The accumulation of goods, luxurious lifestyles, socio-economic changes, and cultural development carry a political and social intent. Natural landscapes set the stage and are combined with these objects in question to accessorize and contextualize the environment. 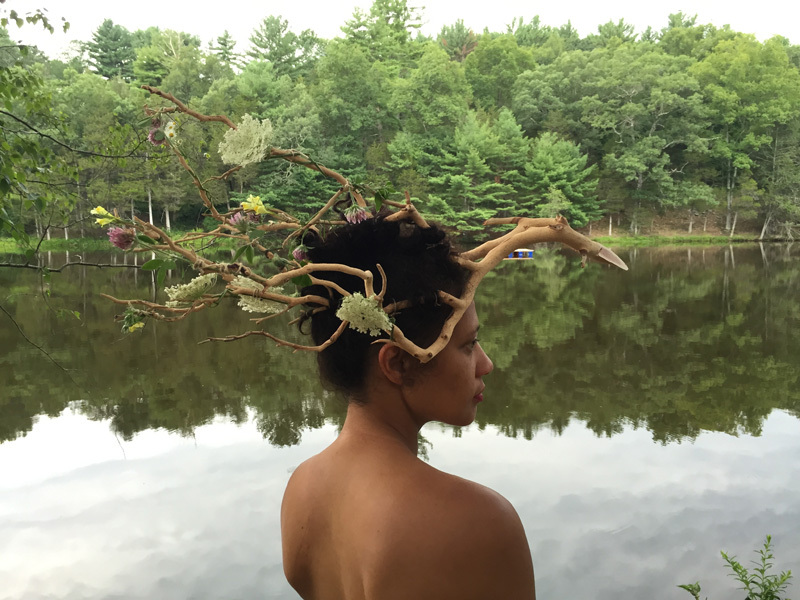 These materials consist of media, costuming, and props that range from handmade to manufactured, and natural to artificial. 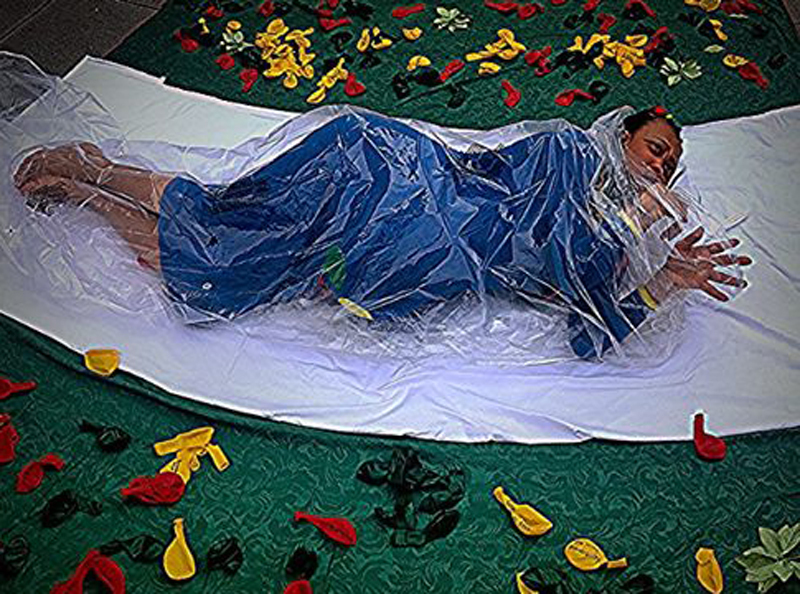 My performance art stems from a visual standpoint, where I aim to create a “tableau vivant” or a living picture. This is where I utilize scenarios informed by histories, political views and archetypes. I like to highlight traditions, cultural ideologies and the effects of migration and climate change. Often working with site-specificity from country to city, and from suburban to urban I hope to invite the viewer to question respect for societal and cultural norms. Most importantly, the state of our natural world. Boston Children’s Museum, “Knot’s Landing”, Boston, M.A. 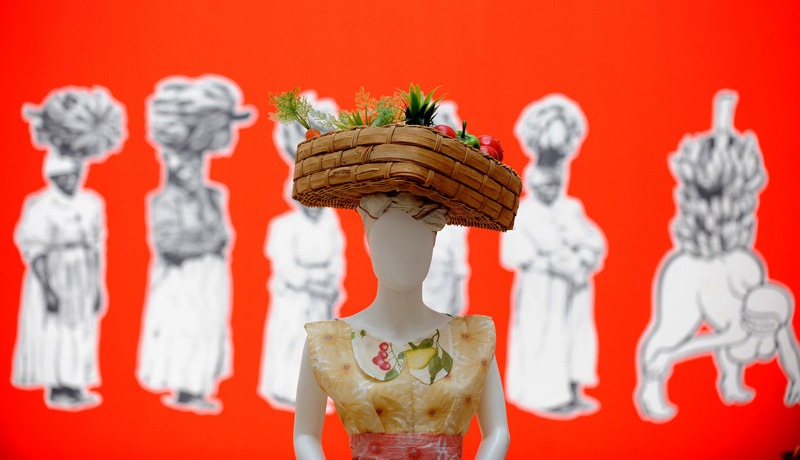 Rush Arts Gallery, ”Mildendranthema Grandeflorum’’, New York, N.Y.
Royal West Academy of England Academy, ’Jamaican Pulse: Art and Politics from Jamaica and the Diaspora”, Bristol, United Kingdom. (catalog). 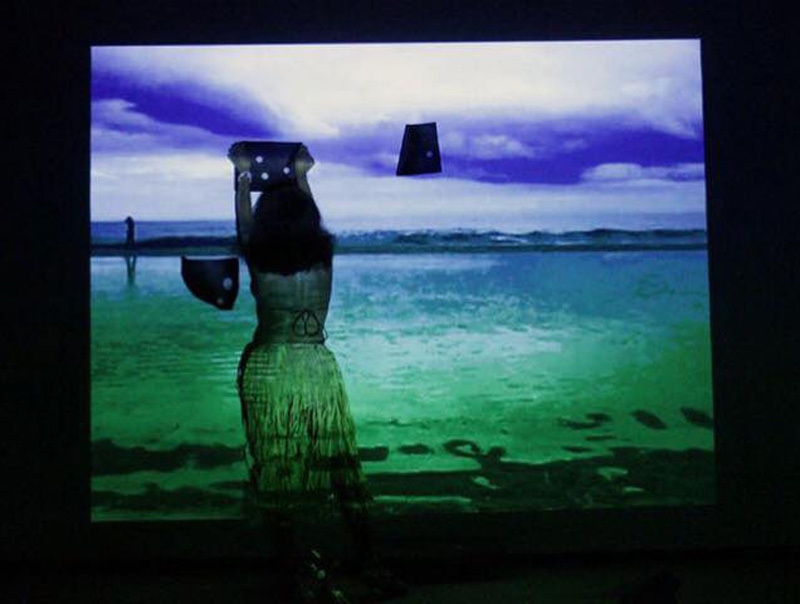 Spring Break Art Fair,‘’Portable Mind’’, New York, N.Y.
Stephen Romano Gallery, “Hieroglyphica”, Brooklyn, N.Y.
Amelie A. Wallace Gallery, SUNY College at Old Westbury,’’ARS CONTINUUM:Amelie A. Wallace Gallery 1978 to the Present’’, Old Westbury, N.Y. 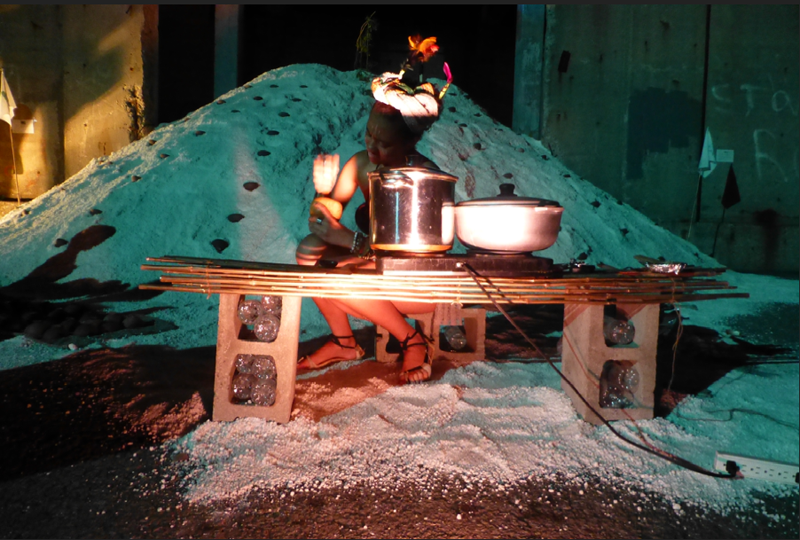 The Haitian Cultural Arts Alliance, ”Borderless Carribean:Unmapped Trajectories-Annotating Art Histories”, Miami, F.L. BronxArtSpace, “Synthetic Zero”, Bronx, N.Y.
Westbeth Gallery, “Re-Formed” (NYFA Artists) , New York, N.Y.
MoCADA (Museum of Contemporary African Diasporan Art) ‘’loop’’, Brooklyn, N.Y.
Art Museum of the Americas, “Outward Reach: 9 Jamaican Photography & New Media Artists” Washington, D.C.
New Orleans Parks, SVA presents Jodie Lyn-Kee-Chow’s “Gypsies’ Picnic’’, New Orleans, L.A.
Royal West of England Academy, ‘’Gypsies’ Picnic: The Veins of Oya was Always Here’’, Bristol, United Kingdom. 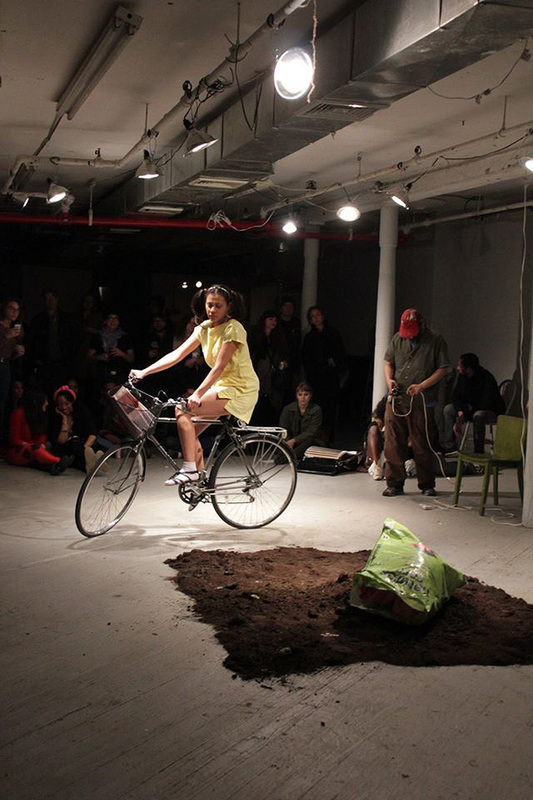 Lehmann Maupin, Nari Ward’s” Ground:(In Progress)”, New York, N.Y.
ABC No Rio, “Affect Surgery”, New York, N.Y.
Atlantic Salt, “LUMEN video & performance art festival”, Staten Island, N.Y.
Grace Exhibition Space, ARC Magazine & VOLTA NY presents “Metanoia: Practices of Exhaustion”, Brooklyn, N.Y.
NYFA Fellowship Award (Interdisciplinary Art), New York Foundation for the Arts, New York, N.Y.
NYFA Fellowship (Interdisciplinary Art), New York Foundation for the Arts, New York, N.Y.
Residency, Dong Dong & LuLu Artist Residency, Beijing, China. 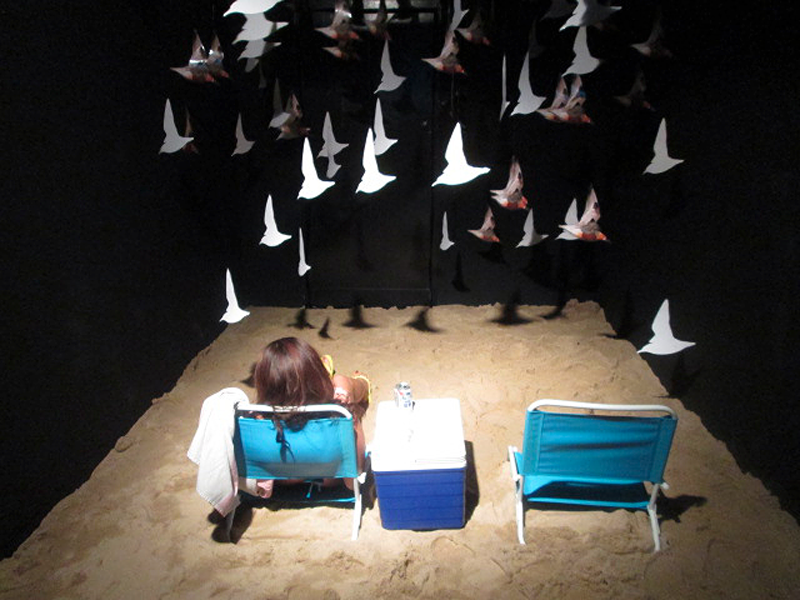 Residency for site-specific work, Art Space, UNESCO A.port, Incheon, South Korea. “Jamaican Pulse: Art and Politics from Jamaica and the Diaspora”, Royal West of England Academy, exhibition catalog, Bristol, United Kingdom, 2016. 12,15, 64, 65, 83, 109, 110, 111. Emergency Index 2012, the Bros. Lumiere for Ugly Duckling Press. Volume 2, pages 320-1. “Jamaican Pulse: Art and Politics from Jamaica and the Diaspora”, Royal West of England Academy, exhibition catalog, Bristol, UK, 2016. 12, 15, 64, 65, 83,109,110,111. Adjunct Professor of Art, MFA, School of Visual Arts, New York, N.Y. 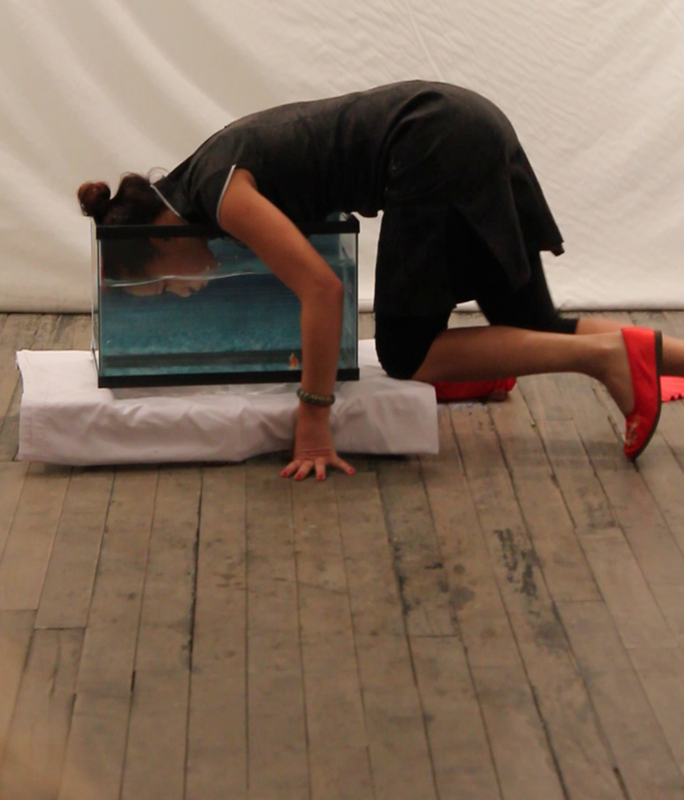 Visiting Artist and Graduate Critiques, School of Visual Arts MFA, New York, N.Y.
Spring Break Art Fair, “Portable Mind: Mind over Matter”, (performance art) New York, N.Y.